On Sunday August 2 1914 Bertrand Russell saw John Maynard Keynes hurrying across the Great Court at Trinity to borrow his brother’s motor-bike to go up to London. He learned that he had been called in to offer financial advice, and realised that the War was close. On Monday morning he lunched with Philip and Ottoline Morrell in their house in Bedford Square; they were both pleased that Philip had agreed to make a pacifist speech in the Commons, though there were too many people to get in to gear that or Lord Edward Grey’s famous statement. During this and the following days I discovered to my amazement that average men and women were delighted at the prospect of war. I had fondly imagined what most pacifists contended, that wars were forced upon a reluctant population by despotic and Machiavellian governments. I had noticed during previous years how carefully Sir Edward Grey lied in order to prevent the public from knowing the methods by which he was committing us to the support of France in the event of war. I naively imagined that when the public discovered how he had lied to them, they would be annoyed; instead of which, they were grateful to him for having spared them the moral responsibility (Autobiography 226). Even more depressing in Russell’s eyes were the number of his friends who had been turned into eager supporters of war thanks to the fate of Belgium. For several weeks I felt that if I should happen to meet Asquith or Grey I should be unable to refrain from murder. Gradually, however, these personal feelings disappeared. They were swallowed up by the magnitude of the tragedy, and by the realization of the popular forces which the statesmen merely let loose. In the midst of this, I was myself tortured by patriotism. The successes of the Germans before the Battle of the Marne were horrible to me. I desired the defeat of Germany as ardently as any retired colonel. Love of England is very nearly the strongest emotion I possess, and in appearing to set it aside at such a moment, I was making a very difficult renunciation. Neverthe-less, I never had a moment’s doubt as to what I must do. I have at times been paralyzed by scepticism, at times I have been cynical, at other times indifferent, but when the War came I felt as if I heard the voice of God. I knew that it was my business to protest, however futile protest might be. My whole nature was involved. As a lover of truth, the national propaganda of all the belligerent nations sickened me. As a lover of civilization, the return to barbarism appalled me. As a man of thwarted parental feeling, the massacre of the young wrung my heart. I hardly supposed that much good would come of opposing the War, but I felt that for the honour of human nature those who were not swept off their feet should show that they stood firm (Autobiography 227-8). In a pamphlet for the Union of Democratic Control, of which be became a member, he described the war as a “great race-conflict” between the Teutonic and Slavic peoples. Britain’s self-interest lay in supporting their Teutonic allies. In Cambridge he tried to recruit dons to the Union of Democratic Control, and he spoke to groups of students. “I remember in the course of a speech saying: ‘It is all nonsense to pretend the Germans are wicked,’ and to my surprise the whole room applauded” (Autobiography 228). The sinking of the Lusitania made a lot of people more firm in their hatred of Germany, he noted. Early in 1915 he published an article called ‘The ethics of war’: his general principle was that if a war furthered civilisation, it was justifiable, but otherwise not. He intended to write a history of Europe to illustrate the problems; all that emerged from this was a pamphlet published at the end of 1915 called The Policy of the Entente, 1904–1914. He took two terms’ leave from Cambridge to work on a project to think about how a new and happier world might emerge from the destruction of the Great War. For a time he worked with D.H. Lawrence on this, until the incompatibility of their ideas became apparent: “it was only gradually that we discovered that we differed from each other more than either differed from the Kaiser. […] He had no real wish to make the world better, but only to indulge in eloquent soliloquy about how bad it was. ” (Autobiography, 230-231). 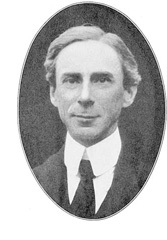 Russell published his Principles of Social Reconstruction in 1916. My relations with Asquith had never become unfriendly. He was an admirer of Ottoline’s before she married, and I used to meet him every now and then at Garsington, where she lived. Once when I had been bathing stark naked in a pond, I found him on the bank as I came out. The quality of dignity which should have characterized a meeting between the Prime Minister and a pacifist was somewhat lacking on this occasion. But at any rate, I had the feeling that he was not likely to lock me up. At the time of the Easter Rebellion in Dublin, thirty-seven conscientious objectors were condemned to death and several of us went on a deputation to Asquith to get their sentences reduced. Although he was just starting for Dublin, he listened to us courteously, and took the necessary action. It had been generally supposed, even by the Government, that conscientious objectors were not legally liable to the death penalty, but this turned out to be a mistake, and but for Asquith a number of them would have been shot. (Autobiography, 233). He did not get on nearly so well with Lloyd George… In January 1916 the British government introduced compulsory conscription for all single men aged between eighteen and forty-one. Russell joined the No-Conscription Fellowship to fight against this, and to defend conscientious objectors. In April 1916 he wrote an impassioned letter to his old friend Gilbert Murray, the classicist, who was supposedly lecturing on ancient history in Sweden, though actually he was working with the Foreign Office to undermine Swedish sympathy for Germany. The issue at stake in the letter was the idea of non-combatant service, which had been rejected by the NCF. We, who believe that it is wrong to fight, are bound not only to abstain from fighting ourselves, but to abstain from abetting others in fighting. What would you and the police think of a man who had a conscientious objection to being a burglar, but was willing to undertake ‘non-combatant service’ by standing in the street and giving warning of the approach of the constable? […] Almost all the C.O.s have a much greater sense of public duty than the average man. They are intensely desirous of serving the community. But for the moment they see no better war of serving it than by suffering for their faith (Letters, pp. 62-3). When his two-term leave ended in May, Russell started teaching again, but very shortly afterwards he was taken to court and fined £100 for impeding recruitment and conscription. I did not pay the sum, so that my goods at Cambridge were sold to a sufficient amount to realize the fine. Kind friends, however, bought them in and gave them back to me, so that I felt my protest had been somewhat futile. At Trinity, meanwhile, all the younger Fellows had obtained commissions, and the older men naturally wished to do their bit. They therefore deprived me of my lectureship. When the younger men came back at the end of the War I was invited to return, but by this time I had no longer any wish to do so (Autobiography 241-2). It was Philip Morrell who paid the fine, and saved Russell’s library from confiscation( Letters, p. 68). In the summer of 1916 Clifford Allen, the chairman of the No Conscription Fellowship, was court-martialled and sent to prison. Russell was at the trial, and there met Lady Constance Malleson, who was usually known by her stage name of Colette O’Neil. The first time that I was ever in bed with her (we did not go to bed the first time we were lovers, as there was too much to say) , we heard suddenly a shout of bestial triumph in the street. I leapt out of bed and saw a Zeppelin falling in flames. The thought of brave men dying in agony was what caused the triumph in the street. Colette’s love was in that moment a refuge to me, not from cruelty itself, which was unescapable, but from the agonizing pain of realizing that that is what men are (Autobiography 235). Russell spent a lot of time in 1916 and through to his own imprisonment in 1918 working for the No Conscription Fellowship. He became more and more radicalised, and was enthusiastic when the Russian Revolution broke out early in 1917. In June he spoke at a conference in Leeds, and supported the resolution of the conference to establish workers’ councils throughout Britain. In London a meeting for this purpose was held at the Brotherhood Church in Southgate Road. Patriotic newspapers distributed leaflets in all the neighbouring public houses (the district is a very poor one) saying that we were in communication with the Germans and signalled to their aeroplanes as to where to drop bombs. This made us somewhat unpopular in the neighbourhood, and a mob presently besieged the church. Most of us believed that resistance would be either wicked or unwise, since some of us were complete non-resisters, and others realized that we were too few to resist the whole surrounding slum population. A few people, among them Francis Meynell, attempted resistance, and I remember his returning from the door with his face streaming with blood. The mob burst in led by a few officers; all except the officers were more or less drunk. The fiercest were viragos who used wooden boards full of rusty nails. An attempt was made by the officers to induce the women among us to retire first so that they might deal as they thought fit with the pacifist men, whom they supposed to be all cowards. Mrs. Snowden behaved on this occasion in a very admirable manner. She refused point-blank to leave the hall unless the men were allowed to leave at the same time. The other women present agreed with her. This rather upset the officers in charge of the roughs, as they did not particularly wish to assault women. But by this time the mob had its blood up, and pandemonium broke loose. Everybody had to escape as best he could while the police looked on calmly. Two of the drunken viragos began to attack me with their boards full of nails. While I was wondering how one defended oneself against this type of attack, one of the ladies among us went up to the police and suggested that they should defend me. The police, however, merely shrugged their shoulders. “But he is an eminent philosopher,” said the lady, and the police still shrugged. “But he is famous all over the world as a man of learning,” she continued. The police re-mained unmoved. “But he is the brother of an earl,” she finally cried. At this, the police rushed to my assistance. They were, however, too late to be of any service, and I owe my life to a young woman whom I did not know, who interposed herself between me and the viragos long enough for me to make my escape. She, I am happy to say, was not attacked. But quite a number of people, including several women, had their clothes torn off their backs as they left the building. Colette was present on this occasion, but there was a heaving mob between me and her, and I was unable to reach her until we were both outside. We went home together in a mood of deep dejection (Autobiography 240-1). Speeches he gave to munitions workers (often pacifists, he noted) led the authorities to ban him from going anywhere near the coast, for fear he might signal to passing German submarines (or this is how Russell put it in his Autobiography). The fact that the Government took him seriously, encouraged him to continue. The end came when he wrote an article for The Tribune, alleging that American troops were going to be used in Britain as strike-breakers. Russell was charged with prejudicing Britain’s relations with its ally, and received a six-month prison sentence in Brixton Prison. There were some Germans there, with whom he had interesting arguments about Kant. He worked out various ingenious ways in which to smuggle out letters, via his two most frequent visitors, Lady Ottoline Morrell and Colette O’Neil. He was released on 14 September 1918 (he had got over two weeks remission for good behaviour), and was in London for Armistice Day. He knew what was going to be announced before 11 a.m. I went into a tobacconist’s and told the lady who served me. “I am glad of that,” she said, “because now we shall be able to get rid of the interned Germans.” At eleven o’clock, when the Armistice was announced, I was in Tottenham Court Road. Within two minutes everybody in all the shops and offices had come into the street. They commandeered the buses, and made them go where they liked. I saw a man and woman, complete strangers to each other, meet in the middle of the road and kiss as they passed. […] I felt strangely solitary amid the rejoicings, like a ghost dropped by accident from some other planet. True, I rejoiced also, but I could find nothing in common between my rejoicing and that of the crowd. Throughout my life I have longed to feel that oneness with large bodies of human beings that is experienced by the members of enthusiastic crowds. The longing has often been strong enough to lead me into self-deception. I have imagined myself in turn a Liberal, a Socialist, or a Pacifist, but I have never been any of these things, in any profound sense. Always the sceptical intellect, when I have most wished it silent, has whispered doubts to me, has cut me off from the facile enthusiasms of others, and has transported me into a desolate solitude (Autobiography 246). I am relying on Ray Monk’s entry in the Oxford Dictionary of National Biography for some of this, but mostly following Bertrand Russell’s Autobiography, which was published between 1967 and 1970, and which I have used in the one-volume edition published by Routledge in 2010. I have also consulted Nicholas Griffin, ed., The Selected Letters of Bertrand Russell. The Public Years, 1914-1970 (London and New York: Routledge, 2001) (and tried to ignore all the terrible proof-reading errors).